Long-time supercross contender joins Monster Energy Yamaha Factory Racing. Former AMA regular Josh Grant has been named as Aaron Plessinger’s replacement at Monster Energy Yamaha Factory Racing for the remainder of the 2019 Monster Energy AMA Supercross Championship. Premier class rookie Plessinger sustained a broken heel after crashing heavily at Daytona’s 10th round of the series, ultimately ruling him of the series. Grant, who last raced a Yamaha in 2014 with the JGRMX outfit, hasn’t lined up this season after being unable to secure a ride for 2019, although he’s excited about the opportunity with Yamaha as he returns to racing. “Although I’m bummed for Aaron, I’m really excited to have this opportunity with Yamaha,” said Grant. “I plan to hold the fort down for him while he takes the necessary time to heal. “I was coming off of an injury last season in supercross, it was unfortunate and took longer to heal than expected but it allowed me to reset my entire body and I feel surprisingly fresh this year. The last time I rode a Yamaha was 2014. 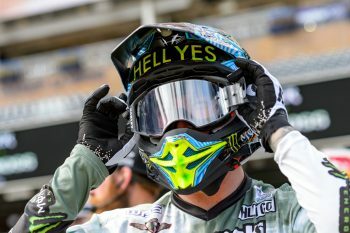 Grant will join Monster Energy Yamaha Factory Racing regular Justin Barcia as the AMA Supercross heads to Seattle this weekend.